Recently announced as one of this year’s iHeartRadio MMVAs performers, Halsey is no stranger to creative expression. That can be said for her music, her style, her many hair colours, and even her ink. The 23-year-old singer has been going under the needle since she was 16, and now boasts over 25 tattoos . From dainty line work, to suave script, she’s been giving us major #TattooGoals ever since her Badlands days in 2015. 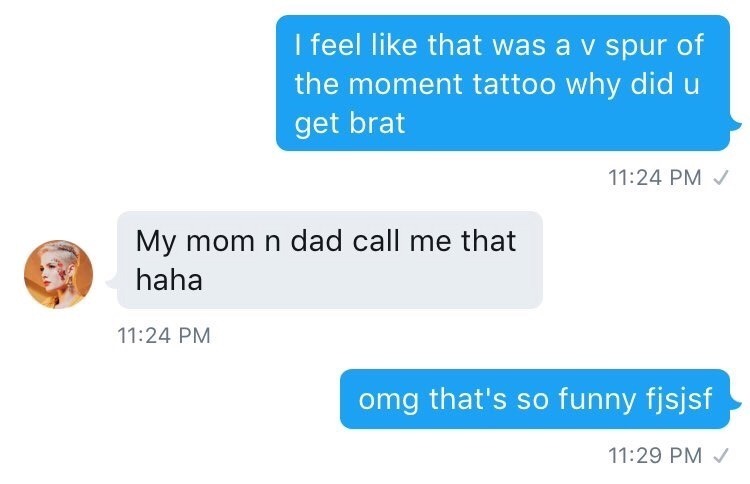 Although “brat” means “sibling” in languages such as Russian, Serbian, and Polish, Halsey’s tattoo represents something entirely different. The singer told a fan via Twitter that she got the tattoo because it’s something that her parents have always called her. At least she considers it as a term of endearment! Although she hasn’t revealed the meaning for this piece, we’re loving the minimalistic vibe of this illustration of two lovers kissing. What we do know is that it was done by Toronto-based artist Curt Montgomery in August 2014. On June 27, Halsey took to Instagram to reveal this teeny, tiny face tattoo positioned subtly by her left ear. Along with Post Malone and Justin Bieber, Halsey finally joined the face tattoo club with this piece, but she was quick to state that this will be her first and only face tattoo. Being a lover of literature at heart, Halsey’s thigh tattoo consists of four elements that are inspired by the classic French novella, The Little Prince. The famous story quotes “It is the time you have wasted for your rose that makes your rose so important,” which just might symbolize all of the blood, sweat, and tears that she puts into her career. I wish I could go back in time and tell myself not to get the two roses tattooed since everybody else in the world has one now. Although this tattoo looks like a self-portrait of the singer, Halsey has yet to divulge the secret meaning behind this piece. One theory could be that it was inspired by Norwegian producer Lido’s album titled Everything. Not only has the producer worked on her debut album Badlands, but he’s also an ex-boyfriend of Halsey. The two didn’t end on great terms, as Halsey even ended up writing the song “Lie” about Lido. For her matchstick tattoo, Halsey decided to do something special with her fans that no other artist has ever done before. The singer gathered three lucky fans on Twitter to meet up with her in an L.A. tattoo shop so that they could all get matching tattoos together. The best part? The girls had no idea what they were going to get, it was all up to Halsey to pick the design. One fan even missed her own prom for the meet-up, but we think it was well worth it. Halsey chose the design of an unlit match to represents not playing all of your good cards like you have them. The unlit match symbolizes potential that can strike at any moment, and Halsey told the girls that when they feel as if they’ve reached that point of potential in their lives, they should go and get the flame added to it, and she’ll do the same. Horoscope-loving Halsey decided to get another matching tattoo, but this time, it was with a friend that she made while on tour. “His birthday is on my half birthday, and I’m a Libra. So my ruling planet is Venus, and his ruling planet is Mars.” she states. When Halsey discovered that the two planets were also opposite, the signs were opposite, and the astrological personalities were opposite, she wanted them to get the other’s ruling planets. Opposites do attract! 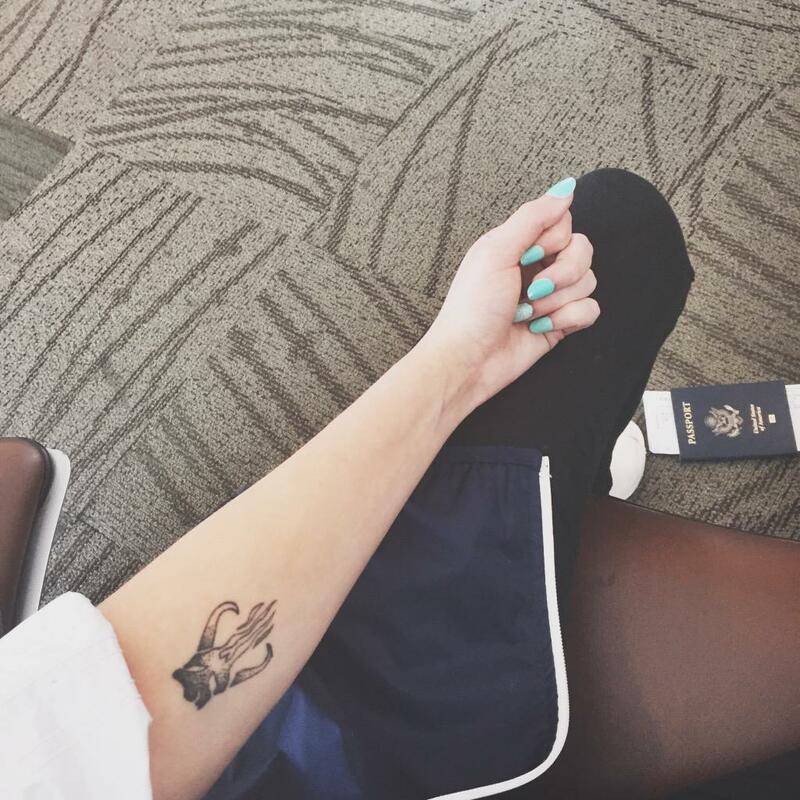 Halsey shows a little sibling love with one tattoo that she’s had for years. May 11, 1998, marks the birthday of her little brother, Sevian Frangipane, so she got this commemorative piece on the back of her arm to show a little love for her little bro. In tattoo culture, it’s known that you aren’t supposed to tattoo a horseshoe upside down, as that symbolizes all the luck spilling out and wasting away. Halsey decided to rebel against the rules and tattoo the horseshoe upside down to symbolize the fact that she doesn’t need luck, she simply works extremely hard and believes that nothing happens to anyone based off of sheer luck. Halsey ended up begging a well-known tattoo artist named Joshua Marks for this piece, as he’s known for his upside-down horseshoes. Representing her sophomore album Hopeless Fountain Kingdom, this may be one of Halsey’s more scandalous placements. Halsey flaunted her booty tattoo for the first time in June 2017, when she was also still rocking her bright-blue mermaid hair. Halsey’s “Serendipity” tattoo located on her ribcage was no happy accident, but the meaning behind the quote definitely was. Love this little new jam. “These violent delights have violent ends” is a Romeo and Juliet quote that Halsey got on Venice Beach right after she signed her record deal. As a lover of literature, she believes that it made sense to her, and she chose this quote as a reminder to pace herself. Halsey’s Om symbol is located on her right inner-arm and represents the sacred sound in Hindu religion. It’s also a mantra in Hinduism, Buddhism, and Jainism. As if Halsey couldn’t get any cooler, she’s also a die-hard Star Wars fan. The singer got a tattoo of the Mandalorian emblem that Boba Fett wears on his helmet. The symbol also represents bounty hunters, which in Halsey’s mind, is a form of badass-ness. Only die-hard Star Wars fans like Halsey will understand this deep-cut reference. This particular piece is the only tattoo she has that’s done in the DIY stick-and-poke style, all of her other pieces are done professionally. 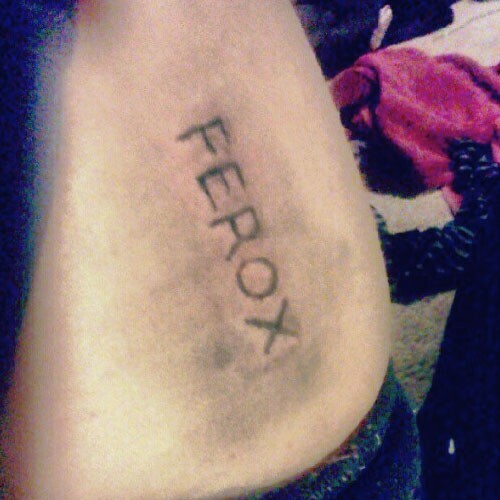 “It means fierce in Latin and was given to me with a sewing needle, India ink, and a lot of vodka.” she tweets in response to a fan. The traditional flash tattoo that Halsey has on her right thigh has an anything-but-traditional backstory. Hollywood-based artist Emily Effler tattooed this cute little typewriter tattoo on Halsey’s spine back in January, making it one of the singers only back tattoos in sight. The “heaven in hiding” tattoo located on Halsey’s right forearm represents one of the songs from her 2017 album, Hopeless Fountain Kingdom.